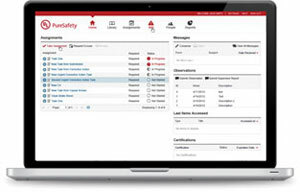 This Learning and Safety Management System helps companies reduce incidents and improve productivity by creating learning moments from real-world operations. The LSMS auto-populates information from real-world incidents and near misses into “in-the-moment” newsflashes and can be incorporated directly into training sessions. Features include “moment-of-need” learning tools that allow mobile devices to scan QR codes for on-the-spot safety refreshers.